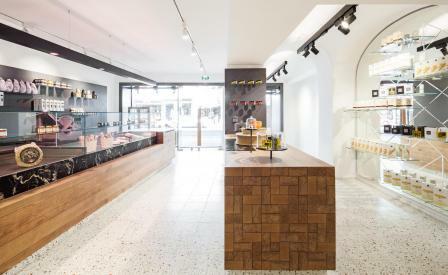 After two decades at Vienna’s famous Naschmarkt, Johannes Lingenhel traded in his much-loved deli stall to set up a brick and mortar establishment that not only houses the city’s first cheese production facility, but is, as he says, an urban food workshop that comprises a food shop, bar, restaurant, private event space and cookery school. Occupying a former manor house dating from 1795, the food emporium has been converted by local firm Destilat to feature rare Austrian terazzo tiles, golden viper granite and a custom-designed butcher block that draws visitors into the street-front shop, where specialty chutneys and fine wines can be bought to go with the mouthwatering selection of cheeses and salamis sliced to order behind the counter. Beyond the bar, where custom angular shelving and sleek taps decant house-made vermouth and tonic, historically protected archways mark the entrance to two Michelin star chef Daniel Hoffmeister’s intimate restaurant quarters from where he produces fresh, seasonal dishes such as creamy burrata with elderflower, cucumber, apple and berry or succulent pork belly served with octopus and aubergine. Intentionally located in the former stables where the labour originally took place, diners are invited past the restaurant, through the open kitchen to the private dining room, where guests can watch the production of camembert, yoghurts and mozzarella, among other cheeses, made from the milk of Lingenhel’s local water buffaloes. Here, elegant Meshmatics chandeliers by Dutch designer Rick Tegelaar accompany original wrought iron hay bales, while restored water basins - no longer used to nourish the stables’ tenants - have been repurposed as ice baths for libations.